Molded of tough, flexible vinyl. It is designed for multiple uses in boats, such as cable pass thru, landing net holder, fishing rod support or protector, stern light holder or any number of other uses. For bulk head pass thru, simply mount and run cables, wires, etc. through to prevent chafing. For land nets, fishing rods, stern light or other items, simply mount and insert items to be protected or held in place. To remove items from utility grommet, simply pull. 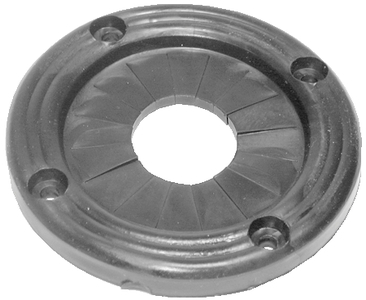 This utility grommet can be used either horizontal or vertical. Install with four pan head screws (not furnished). O.D. 2-3/4", Hole size: 1-3/4".